Get your ticket in-store before the event, or by phone at 602-274-0067. Sign up on TheStoryline.org March 24th through April 14th to tell a story. Eight names will be drawn from the Electronic Hat and posted the weekend before on the TheStoryline.org SLAM lineup page. Two more names will be drawn at the beginning of the show on April 20th. 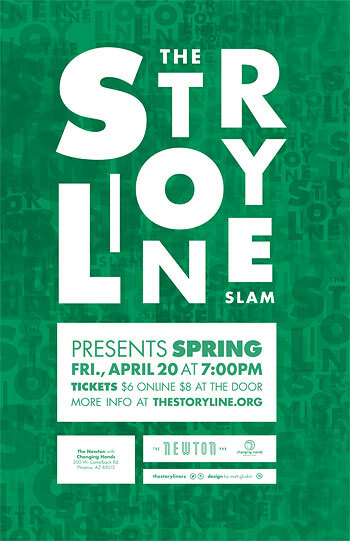 Ten tellers will then have 6 minutes each to share a story based on the theme "Spring." Order at 602.274.0067, by clicking "add to cart" below, in-store prior to the event, or at the door.